With a Brompton bicycle from Tall Tree Cycles you’ll be one of the coolest and most environmentally friendly bureaucrats or businesspeople in Ottawa. All Brompton bicycles fold into small, portable and manageable packages. OC Transpo should love Brompton; they’re Rack and Ride ready, great on the O-Train and you can easily stash ‘em under your desk (or the empty cubicle next to you). Whether you're an AS-01 or the Honourable Minister of Environment and Climate Change, swing by Tall Tree Cycles and we'll set you up with the Brompton folding bike that's right for you … even in "stealth-bomber materials” (see video) - for our Canadian Forces-types). Assists when you need it most - flying up hills or on the long trek to Barrhaven. Small wheels mean fast acceleration from stops and increased manoeuvrability through busy streets. You choose the level of assistance to suit your riding style. 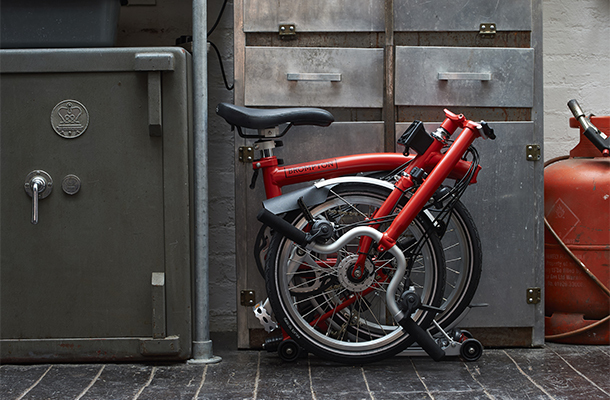 The Brompton Electric folds into a compact package so you can charge and store it safely inside your home or workplace. Customize your ride settings and track your mileage and service history using the Brompton Electric app. Tall Tree Cycles and Brompton folding bikes are your solution to living on-the-go … wherever you want to go. How big is a folded Brompton? 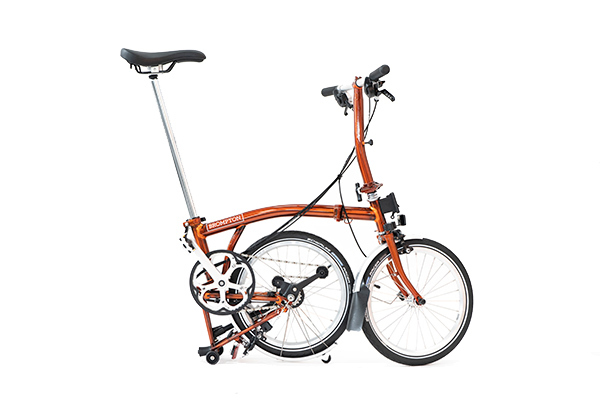 The dimensions of a folded Brompton are 585mm high x 565mm long x 270mm wide (23" x 22.2" x 10.6"). Measurements are based on a bike with folding pedal and a standard seat pillar and saddle. Size will vary slightly by model - e.g. no mudguards reduces height of the folded package. The volumetric size of the folded package is approximately 3.1ft3 (0.089m3).